TORONTO — Like many Bostonians, Ben Affleck has a complicated relationship with the city. He was raised in Cambridge, but moved long ago to Los Angeles, where he became a star. He has told the media that he worries about being typecast as the face of Boston. Yet his biggest professional breakthroughs have involved the city. 1997’s “Good Will Hunting’’ was set in Cambridge and South Boston and made Affleck both a famous actor and an Academy Award-winning screenwriter. A decade later, “Gone Baby Gone,’’ shot in Dorchester, made him a respected director. 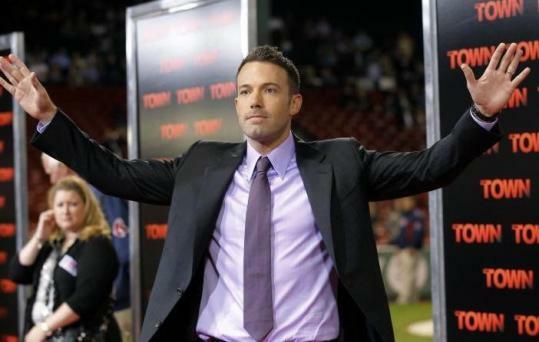 Now comes Affleck’s second feature as a director, the heist thriller “The Town,’’ which got a celebrity-studded local premiere last night at Fenway Park and opens nationally on Friday. It’s the ultimate Boston movie: steeped in local accents and loaded with actors in Red Sox, Celtics, and Bruins gear. Affleck stars as the mastermind of a Charlestown crime ring, wanted by the feds. The movie roams all over, with a holdup at a Harvard Square bank, a brutal car chase through the North End, and a climactic robbery at Fenway Park. Seated on the edge of a sofa last weekend in a hotel suite in Toronto, where he came to present the film at the Toronto International Film Festival, Affleck says he feels a great responsibility to Boston. “I’m not sure how Boston feels about me,’’ he says. “I do know that Boston is a place that — and I was the same way, living there — that likes to see itself reflected, likes its own, likes to see a reflection of its values. Affleck says all this quickly, in part because he’s rushed for time, in part simply because he talks the way a starving person eats: If he doesn’t use the words, someone might take them away. He’s effusive, thoughtful, and, in his natural enthusiasm, even endearingly nerdy. And as much he likes to talk, he’s an active listener. He might ask about whether you liked his brother Casey’s Joaquin Phoenix quasi-documentary, “I’m Still Here,’’ or about your impressions of Boston, a city to which he returns to visit family or to work. The previous afternoon, during the film’s Toronto press conference, one of the producers, Basil Iwanyk, referred to Affleck as the pope of Boston. Jon Hamm, who plays an FBI agent in “The Town,’’ interrupted to clarify: “The pope is the pope of Boston.’’ A day later Affleck is sheepish about the comparison. Overstatement is the producer’s job, he says apologetically. He notes that any local enthusiasm for him and his friend Matt Damon probably has a lot to do with the fact that “Good Will Hunting’’ was a Boston movie. “I think a lot of people in Boston really take pride in the city. It’s the hub of the universe, after all,’’ he says with a laugh. In the last seven years, the city has started feeling like a hub of Hollywood. “Mystic River,’’ “Fever Pitch,’’ “The Departed,’’ “Shutter Island,’’ “Knight and Day,’’ and Affleck’s two movies have all been set in Boston. Opening this fall are at least three more set in the area: “Conviction,’’ featuring Hilary Swank as bartender-turner-lawyer Betty Ann Waters; “The Fighter,’’ starring Mark Wahlberg as the boxer “Irish’’ Micky Ward; and “Company Men,’’ in which Affleck plays an executive from Framingham. This is a development Bostonians are still getting used to. So, in some ways, is Affleck, who’s one of the few natives making movies about the city. “I remember when I was growing up, no one made movies about Boston. There was ‘Blown Away,’ and that was it — oh, and ‘Once Around.’ ’’ Affleck suspects the change has two sources: the tax break that Massachusetts offers film and TV productions that shoot on location, and a desire from moviegoers to see stories that are set somewhere specific. So why does Affleck keep returning to the place he used to call home? To begin with, working in Boston saves him a lot of research, he says. But what he dismisses as “a crutch’’ feels more like a sort of personal devotion. He’s not making movies from a Town Car. He knows how the neighborhoods have changed. “It’s funny, Charlestown and Cambridge are right next to each other but are worlds apart. People only think of Cambridge as Harvard Square and West Cambridge. I haven’t lived there for a while, but now a lot of young professionals move to Cambridge, which is strange. Now all these bars in Central Square, where I grew up, are, like, cool,’’ he says. “When I was a kid and we wanted to go to a bar, we all went to Harvard Square. . . . Central Square was really working class. My mother’s a teacher. It was very cheap. We bought our house for $27,000 in 1979. My father worked at the old Toyota place, Auditorium, on Franklin, which is now gone, then was a bartender at the Cantab and a janitor at Harvard. My mother was a teacher in the public school system. She just retired. That same keen interest in the city’s underclass manifests itself in Affleck’s underrated acting, which often gravitates toward workingmen. But he has doubts about the wisdom of directing another movie in Boston. “I don’t know. I’m nervous. I don’t want to be pigeonholed as Johnny Boston filmmaker,’’ he says. When reminded that undying love for a city never hurt the careers of Martin Scorsese, Woody Allen, and Spike Lee (New York), Gus Van Sant (Portland), or all those Frenchmen whose movies rarely left Paris, he agrees. While this is a city rich in great universities, sports teams, and restaurants, we are poor in directors whose sustained subject is Boston. If Affleck chooses, he could be Johnny Boston all he wants. Wesley Morris can be reached at wmorris@globe.com. Share Have you seen stars of 'The Town' around Fenway?